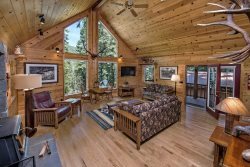 At Wallowa Lake Vacation Rentals, we are always working with our Clients to find the best locations for whatever they may be planning! We have had many years of experience in helping our Clients with their family reunions, corporate/church/4H retreats, and weddings. Family Reunions are a great way for families to reconnect with each other. Many families have found The Wallowa River Camp to be the perfect location! The Wallowa River Camp is located just a few blocks from downtown Joseph, but is on 5 acres of private mature landscaping which will lend to your families enjoyment! Plenty of parking, over an acre of maintained yard, access to the Wallowa River, and a volleyball net and 2 horse shoe pits keep the family together and entertained. The Wallowa River Camp makes the best setting for your family reunion because you can all stay under one roof, plenty of parking, and no fear of waking the neighbors because you don't have any! The Wallowa River Camp has so many great amenities and a lot of our guests return year after year! Here are just a few pictures from some past guests who have enjoyed the Wallowa River Camp as their family reunion go to location. "We have had our family reunion at River Camp in Joseph 3 or 4 times and it is always a wonderful experience. The house and grounds are clean and well groomed and you feel like you are completely secluded though it only takes minutes to walk to town. Joseph is a darling with lots of cute and unique shops and places to get coffee, ice cream or lunch. The setting is amazing and we have made many fond memories there. It is well worth the travel to this lovely town and very accommodating rental house. " Heidi H. and the whole gang! Nike found the Wallowa River Camp the perfect location to design their running shoe called "The Wallowa". Many women's groups have come with their scrapbooks and set up tables and caught up their family memories books. Ladies sewing groups have come and quilted the weekend away. Couple Retreats have been hosted by several churches locally, as well as from afar, and found the setting inspirational. Our local 4H group that my daughter belongs to brought the club and parents up for a team building weekend. This home can accommodate such a large group of people and offers many different sleeping options. Eva of Its Sugar Time Bakery makes the best treats that I have ever tasted. My husband who is NOT a sweets guy even raves about her cupcakes. Eva can make cupcakes, cakes, or other sweets for any event and is very easy to work with. I personally have used her for bake sales, girls weekend treats, and dinner parties. Contact Eva at 541.426.0362 . Oh, my...there are so many things to do at Wallowa Lake or in the towns of Enterprise and Joseph that we can't list them all. We try and keep our ATTRACTIONS page up to date, but if you would like more information mailed to you, please let us know and we will contact the Wallowa County Chamber of Commerce on your behalf and get a Visitor Packet sent to you. At the Wallowa River Camp, we do provide a volleyball net, 2 horse shoe pits for your use, as well as numerous balls for the kids. Feel free to bring your own games to enjoy. We now offer the option of renting Lifetime tables and chairs for your vacation. We offer 20-60 inch round tables ($9/table), 13-8 feet oblong tables ($8/table), and 150 folding plastic chairs at $1.50/chair. If you need white linens, we also offer rentals of these as well at $9/table. If you are having the wedding elsewhere, and you want to rent our tables and chairs, we do offer them for outside rentals and can deliver to your location for a $75 delivery fee and a .50 cent mileage charge for delivery and pick up.